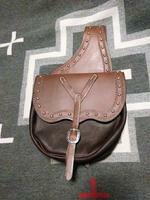 I have one pair of spotted saddle pockets and one pair of spotted Y-Strap saddlebags in sotck. Medium mouthpiece. 5 1/4" wide. Small surface rust on each of them. I am stocked up on FWC Belts! 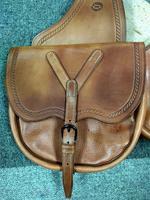 These are all brand new, made by me, with made in the USA buckles. All 45 cal. (45/70). Size is waist size. Single ear headstall made from original F.A. Meanea pattern. Marked with F.A. Meanea Co. stamp. 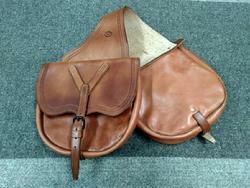 I have two right handed Dragoon holsters. These will fit 1st, 2nd, 3rd Model Dragoons. With toe plugs. 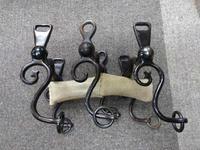 Will fit up to a 2 1/2" belt. 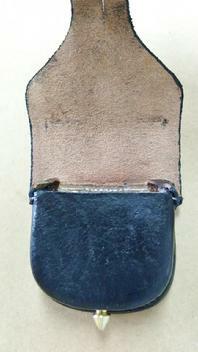 Standard Civil War cap pouch that was modifeid and re-issued for Post-War Use. 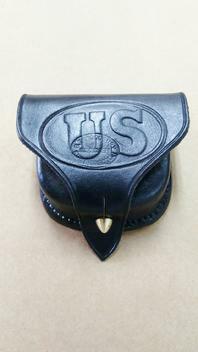 Made to hold 45 Long Colt cartridges. 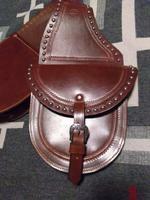 Fits on saber belts or Fair Weather Christian belts. Made in the USA. Dove Wing Style Marked "F.A. Meanea Co."